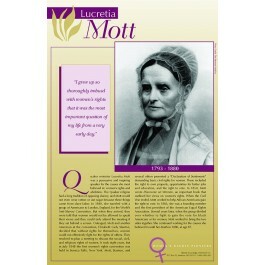 This poster features women's right pioneer Lucretia Mott. It is one of a set of 10 posters on famous women who fought for their civil rights. Born in 1793, Lucretia Mott was a Quaker minister who used her considerable speaking abilities to fight for women's rights and abolition. In 1840, she traveled with a group of Americans to London, England, for the World's Anti-Slavery Convention. But when they arrived, they were told that women would not be allowed to speak their views. Outraged, Mott and another American at the convention, Elizabeth Cady Stanton, decided that without rights for themselves, women could not effectively fight for the rights of others. 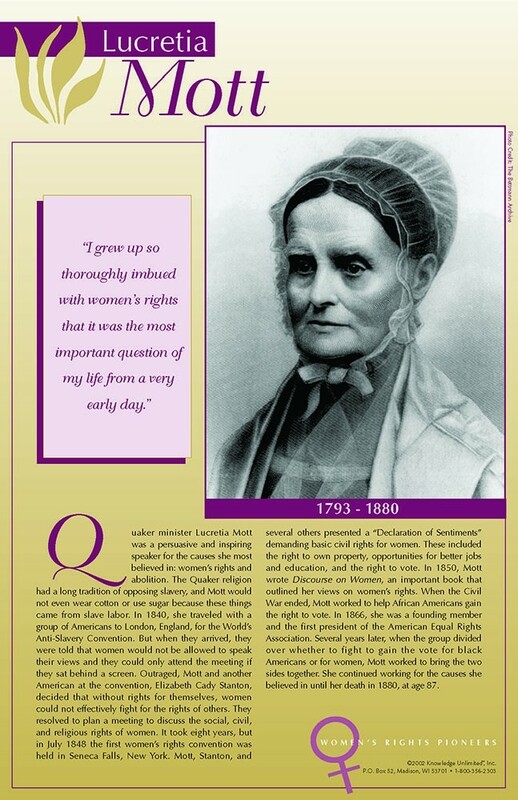 The poster features an image of Lucretia Mott, biographical text, and a quote: "I grew up so thoroughly imbued with women's rights that is was the most important question of my life from a very early day."